All Posts Tagged With: "House File 2420"
I was given the opportunity to sit on the floor of the Iowa House (thanks to Erik Helland) during tonight’s public forum on House File 2420, which allows unions to collects fees from employees that work in the Executive Branch of the Iowa government to cover the costs of contract bargaining and grievance assistance. It became clear that the new selling title for this bill is “Reasonable Reimbursement”. 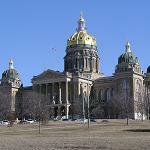 In the Iowa House chamber, there were 58 speakers today, 32 in favor and 28 against House File 2420.